At the invitation of Foreign Minister Wang Yi, Foreign Minister Retno Marsudi of the Republic of Indonesia will pay a visit to China from February 8 to 10. During the visit of Foreign Minister Retno, Chinese leaders will meet with her and Foreign Minister Wang Yi will hold talks and co-host with her the 3rd meeting of the Joint Council for Bilateral Cooperation between the Governments of Indonesia and China. The two sides will exchange views on China-Indonesia relations, China-ASEAN relations and international and regional issues of mutual concern. At present, the relations between China and Indonesia are enjoying a good momentum of development. The high-level exchanges between the two countries are frequent, political mutual trust is deepening, pragmatic cooperation continues to expand, and people-to-people and cultural exchanges are increasing by the day. The two sides maintain close communication and coordination on international and regional hot-spot issues. President Xi Jinping and President Joko have met many times during which they reached important consensus on seeking greater synergy between development strategies of the two countries and strengthening cooperation on the Belt and Road Initiative. This year marks the fifth anniversary of China-Indonesia comprehensive strategic partnership as well as the 15th anniversary of the establishment of China-ASEAN strategic partnership, presenting new opportunities for the development of China-Indonesia relations. We believe that Foreign Minister Retno's visit will further enhance mutual trust and cooperation between the two countries, and promote the continuous and in-depth development of China-Indonesia relations and China-ASEAN relations. At the invitation of Foreign Minister Wang Yi, Chairman Moussa Faki Mahamat of the African Union Commission will pay an official visit to China from February 7 to 9. This will be Chairman Faki's first visit to China since assuming office. During his visit, Foreign Minister Wang Yi and Chairman Faki will co-chair the 7th China-African Union (AU) Strategic Dialogue where they will have a thorough exchange of views on China-AU relations and international and regional issues of mutual interest. China has been developing its relations with the AU which is the most influential and representative inter-governmental organization in Africa from a strategic and long-term perspective. In recent years, China-AU relations have seen all-around development, close high-level exchanges, and deepening practical cooperation. We believe that Chairman Faki's visit will further consolidate political mutual trust, expand all-around cooperation and move forward China-AU relations. Q: According to reports, on February 2, a senior US treasury official accused China of supporting the government of Venezuelan President Nicolas Maduro through "murky oil-for-loans agreements". What is your response to this? A: The relevant remarks by the US are totally groundless and highly irresponsible. The financial cooperation between China and Venezuela is carried out by the financial institutions and enterprises of both sides in accordance with commercial principle for mutual benefit and win-win outcomes. The contracts signed by the two sides fully comply with international norms and all operations are conducted in accordance with laws and regulations, with outcomes to benefit the local people. According to incomplete statistics, the cooperation between China and Venezuela has supported the construction of more than 10,000 affordable housing units and completed power projects whose generating capacity accounts for 10% of the total installed capacity of Venezuela, provided household appliances at preferential prices to over three million low-income Venezuelan families and enabled 700,000 Venezuelan households to have access to satellite television services. The cooperation between China and Venezuela has effectively promoted the economic and social development of Venezuela and been welcomed and supported by people from all walks of life in Venezuela. A stable Venezuela is in the interests of all parties. 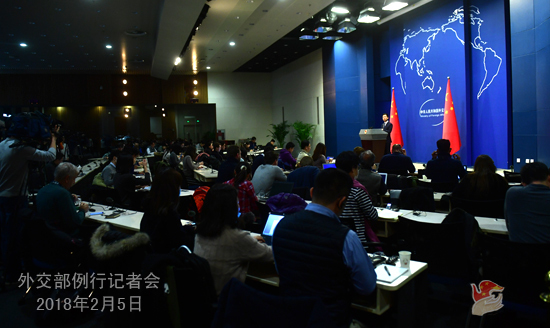 China always adheres to the principle of non-interference in other's internal affairs. 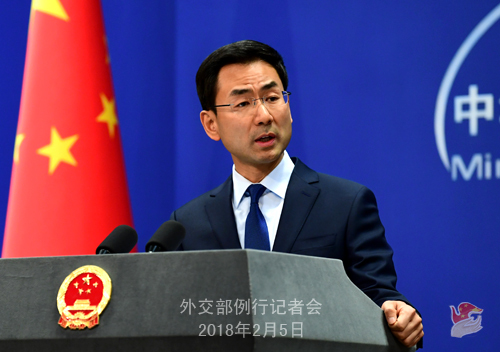 On the Venezuelan issue, China advocates that all parties should resolve the domestic issue through dialogue and consultation within the legal framework. At the same time, China is willing to continue to help with its steady economic and social development through bilateral pragmatic cooperation. Q: According to media reports, the US Department of Defense published a new Nuclear Posture Review Report recently. What is your comment on the report? A: The Nuclear Posture Review Report recently issued by the US Department of Defense comes in line with the US National Security Report and National Defense Strategy released not long ago, which clings to the outdated cold-war mentality and zero-sum game mindset, plays up geopolitics and great power competition and reinforces the role of nuclear weapons in national security in disregard of the call of the international community for nuclear disarmament and against the dominant theme of peace and development of our times. While possessing the largest and most advanced nuclear arsenal in the world, the US is still vigorously building up its nuclear force, which will exacerbate the global strategic imbalance. By developing low-yield nuclear weapons and lowering the threshold for using nuclear weapons, it will increase the risk of using nuclear weapons. In abandoning the objective of nuclear-weapon-free world, it will jeopardize the international nuclear disarmament process. China has been actively engaged in building a community with a shared future for mankind, advocating the new concept of common, comprehensive, cooperative and sustainable security, and upholding a self-defensive nuclear strategy. 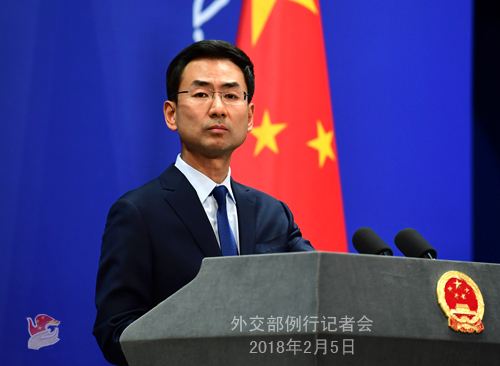 China firmly stands for the ultimately complete prohibition and thorough destruction of nuclear weapons and sticks to the policy and commitment of no-first-use of nuclear weapons and not using or threatening to use nuclear weapons against non-nuclear-weapon States or nuclear-weapon-free zones. China has never taken part and will never take part in nuclear arms race of any kind, and will continue to keep its nuclear capabilities at the minimum level required for national security. All these policies remain unchanged for more than half a century since the first day when China came into possession of nuclear weapons. This report by the US attempts to seek excuse for expanding and strengthening its own nuclear arsenal by deliberately distorting China's policies and practices, which is doomed to be a futile effort. We hope that the US will abandon the cold-war mentality and zero-sum thinking, stop viewing relations between major countries in a confrontational perspective, keep up with the trend of peace and development of the times and undertake its special and primary responsibilities for nuclear disarmament. It should continue to significantly reduce its nuclear arsenal in an irreversible manner, decrease the role of nuclear weapons in its national security, and maintain international peace and stability with concrete actions. Q: British Prime Minister Theresa May just concluded her visit to China. What is China's comment on this? A: From January 31 to February 2, British Prime Minister Theresa May paid an official visit to China and held a new round of the annual summit between Chinese Premier and British Prime Minister. President Xi Jinping, Premier Li Keqiang, and Chairman Zhang Dejiang met respectively with Prime Minister Theresa May for an in-depth exchange of views on jointly building an enhanced version of the "Golden Era" for China-UK relations. They reached broad consensus and the visit was a great success. The two sides agreed that maintaining a sound and stable development of China-UK relations conforms to the common interests of the two sides and is conducive to promoting peace, stability and prosperity in the region and the world at large. At present, both China and the UK are at a crucial stage of their respective development. The two countries will continue to strengthen political mutual trust and pragmatic cooperation in various fields on the basis of mutual respect and equality and in light of their respective development stages and needs so as to keep bilateral relations abreast of the times and promote the global comprehensive strategic partnership between the UK and China facing the 21st century. China and Britain are important economic and trade partners to each other. The two sides agreed to continue to deepen cooperation in such fields as economy and trade, investment, nuclear power, finance, infrastructure and third-party markets, and actively explore emerging cooperation fields such as artificial intelligence, clean energy and technological innovation. During the visit, the two sides signed cooperation documents on investment, finance, science and technology, aviation security, smart city, animal quarantine and others. The total value of business deals amounted to about 9 billion pounds, and a Sino-British Entrepreneurs' Council was set up to put bilateral practical cooperation on a fast-track to quality growth. The leaders of the two countries conducted in-depth exchanges on the "Belt and Road" cooperation. The British side reiterated its positive attitude toward the Initiative. The two countries are willing to further strengthen mutually beneficial cooperation under the framework of the Belt and Road Initiative. During Prime Minister May's visit, we also arranged various people-to-people exchanges and cultural activities. We will continue to encourage such exchanges between the two sides to consolidate the public support for the relations between the two countries. China and the UK all agreed that economic globalization is conducive to safeguarding world peace and that the international community should continue to champion free trade and oppose protectionism. As two major countries and permanent members of the UN Security Council, China and Britain will further strengthen their communication and cooperation in international affairs so as to promote world peace and development. The two sides also established a mechanism for dialogue on the UN affairs. Prime Minister May's successful visit to China made a good start in the new year for the China-UK relations. Next, we are ready to make joint efforts with the British side to implement the consensus reached by the leaders of the two countries and to promote greater development of the "Golden Era" for China-UK relations in the new era. Q: We have learned that a report by a group of independent investigators for the United Nations on the sanctions effort against the DPRK says that the DPRK, over the last year, earned 200 million dollars from banned commodity exports, including shipping coal to Chinese ports using fake paperwork and sending weapons to both Syria and Myanmar. Has the Chinese government seen this report and what is its comment on this report? A: As far as I know, the report you mentioned is still undergoing the internal review process of the relevant UN Security Council sanctions committee. At present, I am not in a position to comment specifically on the report to the media. I would like to point out here that: first, China always maintains that relevant resolutions adopted by the UN Security Council should be fully and strictly enforced. Second, as a permanent member of the Security Council, China has always taken the lead in comprehensively and strictly implementing the Security Council resolutions on the DPRK and fulfilling our due international obligations. Q: According to reports, the government of the Maldives has taken measures to maintain social order as tension continues to rise amid serious divergences over the verdict issued by the Supreme Court in that country recently. What is China's comment? A: China has been closely following the situation in the Maldives and supports relevant parties in that country in properly resolving differences through dialogue and negotiation and upholding national and social stability. We have asked the Maldives to take necessary measures to faithfully protect the security of Chinese enterprises, institutions and personnel. Q: The Commerce Ministry announced an anti-dumping and anti-subsidy investigation into imports of sorghum from the United States. There are reports saying that such move could potentially set off new trade tensions between China and the United States. Some people have suggested that this investigation might be China's reaction to the solar panel decision by the United States. What is China's response? A: Last weekend, the Chinese Ministry of Commerce already issued a public notice on the anti-dumping and anti-subsidy investigation into imported sorghum grown in the US. My colleagues from the Ministry of Commerce have already given an interview to the media in this regard and I will not repeat what was said there. I just want to emphasize that this is just a normal individual case of trade remedy investigations. With regard to the global safeguard measures on solar panel products taken by the US recently as you mentioned, the Chinese side has already responded to that. If I remember that correctly, on January 23, my colleagues from the Ministry of Commerce have already issued a statement to the media in this regard and you can check that on the website of the Ministry of Commerce. As for the economic and trade issues between China and the US, we have repeatedly said that the China-US Economic and trade cooperation is mutually beneficial and win-win in essence. We stand ready to work with the US to deepen the economic and trade cooperation to the benefit of the two peoples. We hope that the US side will work with the Chinese side for the shared goal through concrete actions. Q: Both the United Nations Commission on Human Rights (UNCHR) as well as several countries including the US and India have called on the government of the Maldives to implement the supreme court order to release the opposition politicians and the former president. You said that they should peacefully settle this issues through negotiations. How does China look at this particular verdict of the supreme court and its implementation? A: What happens for the time being in the Maldives falls within the internal affairs of that country. China supports all relevant parties in the Maldives in properly resolving differences through dialogue and negotiation and in safeguarding national and social stability. Q: According to reports, mass rallies were held in the capital of the Maldives recently. Have the Chinese citizens and institutions in that country been impacted so far? A: We have received no report of Chinese citizens or institutions impacted in the Maldives. The Foreign Ministry and the Chinese Embassy in the Maldives attach high importance to upholding the security and legitimate rights and interests of Chinese citizens and institutions in the Maldives. We have issued security alert in response to the security situation on the ground. The Spring Festival is the peak season for Chinese citizens to travel to the Maldives. However, given the security situation there, we advise the Chinese tourists who are now in the Maldives to closely follow the security situation and enhance self-protection. In the meanwhile, Chinese citizens are advised to avoid going the Maldives until the situation on the ground is stabilized. The Foreign Ministry and the Chinese Embassy in the Maldives will continue to closely follow the security situation and adjust the security alert level accordingly. Chinese citizens and institutions are advised to follow that closely. Q: On February 2, in an interview with the Straits Times, Singapore's Foreign Minister Vivian Balakrishnan said that the current situation in the South China Sea has become much calmer, and both ASEAN and China have the goodwill and confidence to open the text negotiation of the COC, which in itself is a very positive step . What is China's comment? A: China's ancient saying goes that "when the river becomes warm in spring, the duck would be the first to know". The same is true that when the regional situation improves, countries in the region know the best. 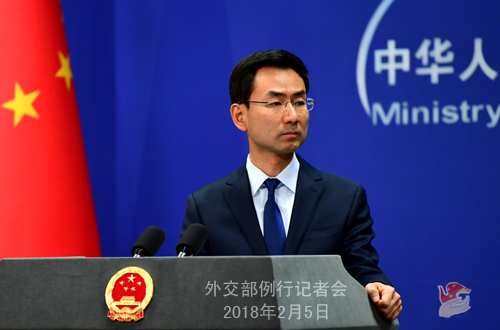 The Chinese side speaks highly of Foreign Minister Vivian's remarks which we believe objectively reflect the improving situation in the South China Sea. China is confident that ASEAN countries will continue to comprehensively and effectively implement the DOC, actively promote the COC consultations and jointly safeguard regional peace and stability.